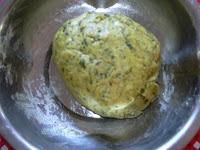 Add methi leaves, salt, cumin seeds, turmeric powder, chillies powder and salt to the wheat flour and mix it well. Add just required amount of water and make a nice and soft dough. Spread the sesame oil on top of the dough, cover it and keep it aside for half an hour to one hour. Make small balls (a medium sized lemon) out of the dough and roll it into a circle form. 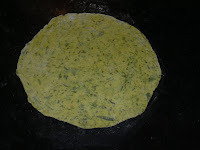 Heat the pan, cook the rotis under medium heat. 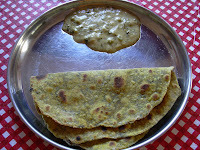 Apply ghee (optional) on top of it and enjoy it with some nice side dish. hey nice blog....u2 tamil huh?? vidhya very good and very informative blogs u have.Keep going.